If you want your motherboard to control the cooling inside your computer then Gelid's 1-to-4 PWM Fan Splitter could be what you are looking for. Gelid's 1-to-4 PWM Fan Splitter allows the user to connect up to four PWM fans from just one PWM fan header on the motherboard. And because the fans are PWM the RPM of each fan will change dependent on the temperature of the CPU and/or motherboard BIOS settings, meaning the RPM and therefore noise will be reduced if the system does not demand high airflow. 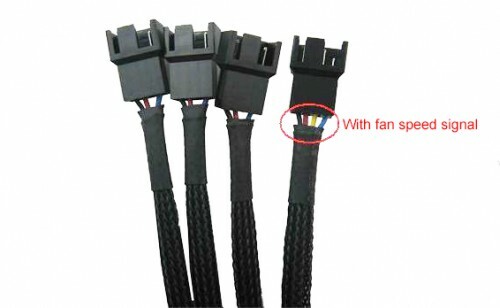 The extra power required to run four fans from this splitter is provided by the 4-pin molex connector, which does need to be connected if more than one fan is used. 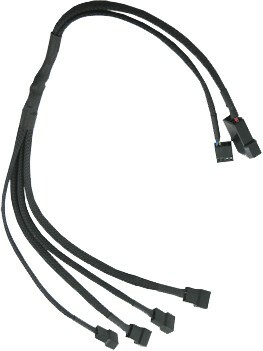 The cable has one PWM connector with fan speed signal wire which is connected to the first fan. The extra wire on that connector will feed back the speed of that first fan to the motherboard. The other three plugs can be used to connect three further fans but the motherboard can’t know what speed they’re running at, hence no need for the fourth wire on those plugs. Good! Achieved my objective as intended! A tip for mini-itx mobo: Attach it to the cpu 4 pin pwm header instead of the system 4 pin header on the motherboard. Not sure of others but my MSI z170i gaming pro's 4 pin system fan connector on the motherboard is not pwm controlled but instead is voltage controlled so the fans were spinning full speed all the time for all connection with the splitter! But after connecting it to the cpu connector (and connecting the cpu cooler to the 4 pin connector of the splitter) that is not and issue! I can now install 4 fans on my Fractal Define Nano S mini-itx case with one more spare fan to spare! This fan splitter works perfectly to have four fans working off one connector on the motherboard, of which all run at the same speed depending on the settings you apply to one fan. The only issue I encountered was that the build quality of the molex pins seemed to be a bit poor and it was not easy to connect to the PC. Luckily I ordered two as the first one broke during installation. I used one of these to power and control the CPU; two top exhaust; and one rear fans in a Gelid Dark Force case. Getting it all connected was very fiddly at first, but the second build was much easier.